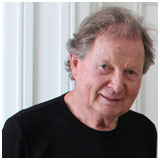 Philip Hughes CBE (1954), born 30 January 1936, is a highly respected painter whose work is held in a number of public collections in the UK and around the world. Philip studied economics at Clare and joined Shell as an engineer when he graduated in 1957, becoming a computer consultant in the early 1960s. He was a co-founder of the multinational IT and management consultancy company Logica plc in 1969, where he held the roles of Managing Director (1969-72) and Chairman (1972-91). Self-taught as an artist, Philip places the relationship between landscape and human history at the heart of his work. Over the course of some forty years he has walked in five continents to map out a distinctive, distilled vision of landscape in which topography plays a central role, as it did for early man in establishing his first sacred sites and ceremonial centres. His preoccupation with the structure of landscape and the archaeology of ancient cultures a year spent in the Andean countries of South America in 1975, lincluding a stint working at many of the pre-Columbian ceremonial centres in the Americas, from Monte Alban in Mexico to the Anasazi villages in the USA. Philip has served on the council of the Royal College of Art (1987-1992), the board of the Design Museum (1990-1996) and as Chairman of the Trustees of the National Gallery (1996-2000). His work is represented in numerous public collections including The British Museum, the V&A, the UK Government Collection and the Library of Congress, Washington D.C., USA.